May | 2010 | Another Beautiful Day in Paradise! One of my favorite fellow bloggers, Jana over at The Meanest Mom, has a post about her family’s recent goldfish funeral. It reminded me of a funny story from my childhood and an old, but still funny, joke. 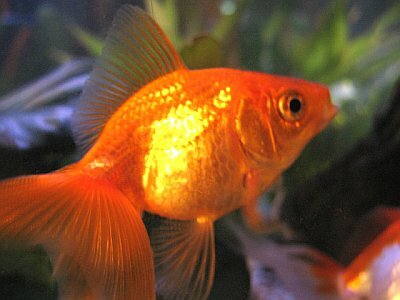 When we were teens, my brother and I got my younger sisters a pair of goldfish for a present. As they always do, one eventually died. My brother wasn’t around when my Dad flushed the deceased pet. When he got home he asked me what had been done with the fish. I made a flushing motion with my hand and also an appropriate flushing sound-effect. I guess my brother should get credit for a vivid imagination. Yuk. And speaking of dead goldfish, here is an oldie but goodie. 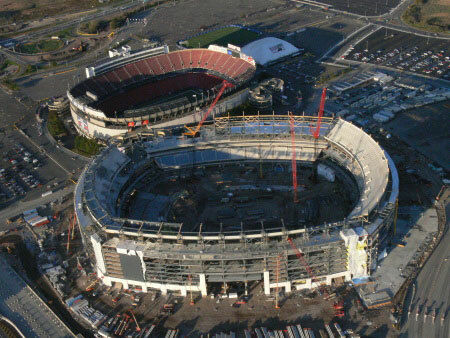 The NFL has announced the 2014 Super Bowl will be played outdoors at the Jets-Giants new Meadowlands Stadium. That’s just crazy. The game is scheduled for February 2nd. It’s cold in New Jersey at that time of year. Let’s not forget, Super Bowls are not played during the day anymore. They are prime time extravaganzas. That means you can knock about ten degrees off of whatever was the daytime high. It may not mean much for the players, but I can’t imagine a great Super Bowl experience when my bottom is frozen to the seat. Fortunately (or unfortunately, as the case may be), I doubt I will have the opportunity to find out for myself. I grew up in and around Pittsburgh, but there is a reason I went to college and spent most of my adult life in the South. I’ll battle the sun and heat at The Swamp any day. No frostbite at the football game, please. Another female teacher has gotten in hot water for messing around with her students. She was a “Teacher of the Year” no less. This certainly does not bring back memories of my high school experience. Why would someone think that is a good idea? Apparently the latest front-runners for the Darwin Awards, aka“How much more stupid can I be?”, involves teenagers pouring vodka into their eyes. Wouldn’t that sting just a little? Besides, it’s a terrible waste of good Grey Goose. Bumper sticker I saw this morning – “My child doesn’t need validation from a bumper sticker.” Ha! In the early 1990s we were living in Oklahoma, far from both our families in Pennsylvania and Florida. We wanted to combine a vacation with a visit to Mrs. Poolman’s family in Jacksonville. The plan was to have the opportunity to visit, but not necessarily have to deal with family 24/7. (If you want to hear God laugh, just tell him your plans.) Our solution, which we thought was brilliant at the time, was to rent a beach-front condo in Jacksonville Beach, about a half hour drive from the in-laws home. We were wrong. We totally miscalculated Mother-in-Law’s guile and talent for conspiracy. I need to say that I loved my late in-laws. I really did. Overall, we got along fabulously. FIL was laid-back to a fault. MIL, on the other hand, made up for her husband’s low initiative by being a fanatical planner and instruction-giver. She was always well meaning, but occasionally got carried away with her plans. That summer was one of them. A few days before we flew to Jacksonville, Mrs. P was talking to her mother on the phone about the upcoming trip. MIL enthusiastically told Mrs. P that she had come up with a wonderful idea. She had rented another condo in the same building for the same week. She thought our idea of a vacation sounded like such fun she decided they would join us. And she had invited her brother and sister-in-law, and her three other grandchildren, ages roughly seven to 13, to spend the week with them. And so they did. Of course, the cousins all wanted to spend every waking moment together. The result was that rather than having a quiet week at the beach with our two children, we “enjoyed” a large group vacation with just about Mrs. P’s entire extended family. It wasn’t terrible; I wouldn’t classify it as a “vacation from Hell.” But it certainly wasn’t what we had planned. I don’t think my mother-in-law ever really figured out why we didn’t appreciate her scheme. We never “vacationed” in Jacksonville again. During the course of a recent conversation, we started talking about vacations gone bad. Daughter / Writer Princess regaled the group with the story of her brother’s (Poolboy’s) first encounter with alcohol. It was the nadir of one of those weeks-from-hell vacations. We had rented a cabin in the North Carolina mountains, and included Mrs. Poolman’s late father, sister and her two teenaged children in the plans. The week got off to a rough start when Father-in-law (FIL) fell and broke his shoulder when he and SIL stopped for gas on the way up from Florida. Rather than getting it attended to at that time, he insisted he was OK and so they continued the trip for another two hours up into the mountains. By the time he got to the cabin, he had changed his tune and was in considerable discomfort. We spent our first night of vacation driving back to civilization, and two different hospitals to have FIL’s fractured shoulder X-rayed and treated. The docs recommended FIL not travel for at least a week, so that dispelled any notions of just cancelling the “vacation.” We spent the week in a small cottage, caring for FIL and trying to come up with enough activities to keep the four teen-agers busy. As hinted above, one evening, Poolboy and “B”, his male cousin, found their amusement in a bottle of Jim Beam that B had smuggled along on the trip. They kept it quiet. We didn’t discover the indulgence until Mrs. Poolman got up to go to the bathroom in the middle of the night. She wondered why she couldn’t open the bathroom door. It seems that Poolboy was passed out on the floor while hugging the “porcelain queen.” As you might imagine, the next day both Poolboy and B felt like they would die. We had no sympathy. That was as close as Mrs. Poolman ever got to killing and eating her children. Part II of Awkward Vacations still to come. Where did you go, Tom Swift? We had a lazy weekend, a nice break from some of the hectic work-around-the-house weekends of the past few months. My sister, M, and BIL, T, drove down for the weekend. We had originally planned a Savannah history weekend that was to include their next door neighbors C and Mc. This all started when we took a trip to Mrs. Poolman’s sister’s mountain house last summer. Mc and I discovered we had very similar history interests and started talking about a trip to Savannah.We were going to visit some museums and historic sites. Unfortunately, the neighbors couldn’t make it this time, so the history agenda was put on hold. We’ll try it again later in the year. Meanwhile, the rest of us had an easy weekend of loafing, talking, eating and drinking. Not a bad plan. 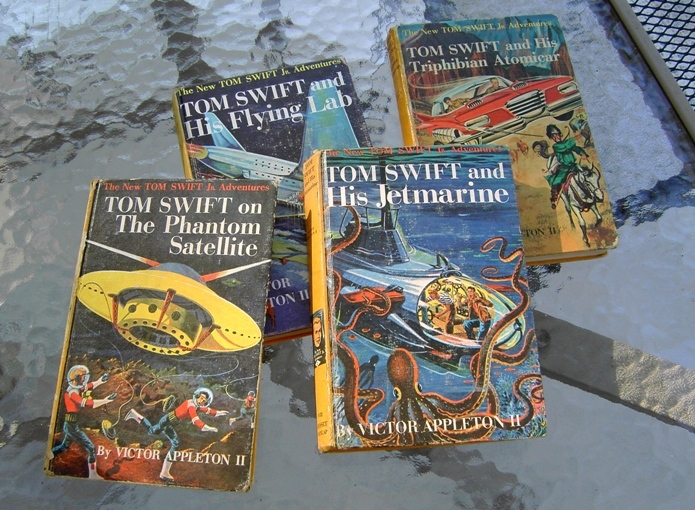 M had been cleaning out her attic lately and brought me an unexpected treat, a box of old Tom Swift books. These were books left over from my childhood that somehow ended up at her house. What a flash back! When my brother and I were in the 7-10 year old range, we devoured the entire series of roughly 24 books. We LOVED them. We waited in anticipation for Victor Appleton II to write the next book in the series. The series was similar in genre to the Hardy Boys, Nancy Drew and Trixie Belden books, and published by the same publisher, Grosset and Dunlap. The main character was Tom, an 18 year old child-prodigy genius inventor. He and his pal, Bud Barclay, invented something new each book and went off on some adventure. They were always ran into some bad guys, but came out on top. It was great stuff for a couple of guys just falling in love with reading for pleasure. I need to flip through a few of these to see if they are hopelessly outdated, or if some child we know might enjoy reading them. We have had a busy week with little time for updates. I spent most of Wednesday with children. Some of the experiences were pleasant, and others less so. I was asked to work a career fair at a local elementary school. I don’t mind doing career fairs, but I had some concerns about doing one at an elementary school. I accepted because it was a close-by school and the wife of one of our faculty is a teacher there. I figured that fourth and fifth graders are old enough to grasp the concepts. I should have listened to the little voice that was telling me it was a mistake. They had the various presenters set up in a noisy cafeteria. Every ten minutes a new class would come by and sit at my table for a short presentation. It turns out the entire fifth grade was off on a field trip that day. (Great planning there!) I think I spoke with one fourth grade class. More than half of the roughly 12 classes that came to my table were kindergarten or pre-k. As much as I love little kids, it is ridiculous to try to conduct a meaningful presentation on careers in science with a group of four, five and six year olds. It was a total waste of time and energy. I sent the school a follow-up email. I was polite, but I shared my negative impressions with them. Later that evening, we had our last CCD class of the year. A handful of parents and younger siblings also joined the party. I got the kids juiced up on chocolate chip cookies and ice cream sandwiches and then we had a “quiz bowl.” They drew random questions out of a bowl, with subjects including anything we had covered throughout the year. I had three teams – two of all-girls and one of the guys. It started off slow. None of the three teams were able to answer either of the first two questions. Then it started picking up. I was a little surprised that the guy-team absolutely skunked the two girl-teams. Maybe I shouldn’t have been so surprised. The guys were very competitive, while the girls were all a-twitter over it being the last class. They were having entirely too much fun giggling and cutting up. I did get in one subtle “dig” at the parents who were present. One of my constant aggravations each year is the lack of any reinforcement many of my students get at home. For too many of my students, the only exposure they get to their faith is the 45-50 minute CCD classes once a week. One way I know this is when we talk about the Sacrament of Reconciliation, which should be received frequently, and is required at least once a year. In our discussions, I can tell that most of the class received the sacrament once, when they were six or seven years old and not since then. I know it was a cheap shot, but it felt good anyway. How did I spend an entire weekend, staying very busy, but still didn’t get the checkbook updated, the bills paid or my laundry washed? Oh well, I know what I’ll be doing this evening. Saturday was the work-around-the-house day. I spent a couple of hours edging our yard. This is a bigger task than it may seem simply because we have a large corner-lot. It’s not just the edging, but also the clean-up. 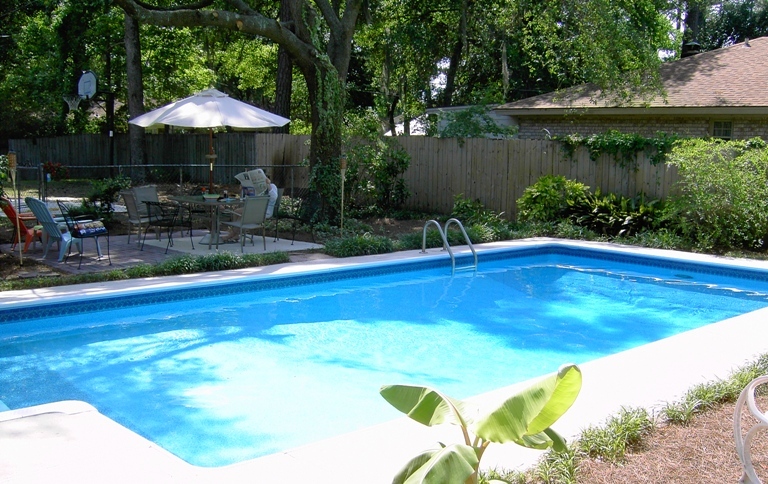 I spent the rest of the afternoon cleaning the pool and bleaching the house. We live in the humid South. Although we have a brick house, the wood trim develops mildew and looks terrible. A bleach solution, a sprayer and the garden hose take care of it, but it is work. I had to hurry to finish the pool work in time to shower and dress for 530 mass. It was my turn to lector, so there was no putting it off. After mass, we linked up with our friends, the W’s for dinner. They treated us to dinner a couple of weeks ago, so it was our turn to return the favor. We went to the Crystal Beer Parlor in downtown Savannah. This is an old, historic restaurant that closed several years ago. A couple of brothers bought the property and resurrected it just a short while ago. I used to go to the original place fairly frequently, especially when I worked downtown, but I had not had the chance to visit the “new and improved” version until Saturday. Fortunately, the new owners stuck with the original concept – many brands of beer and a menu of burgers, salads, sandwiches and a few specialties. It looks like they have a winner. I introduced Mrs. Poolman to a beer I first tried on a business trip — Sweetwater 420. This is a small brewery / brand out of Atlanta. She must have liked it since she had two glasses. On Sunday, we had lunch at our favorite Mexican restaurant, ran a few errands and then headed home to finish the preps for our first “open pool” of the season. Mrs. Poolman reading the Sunday paper under the umbrella. Daughter and son-in-law came over, along with a few other friends. We had a nice time sitting around and in the pool, and visiting. I tossed some burgers and brats on the grill. All told, it was nothing fancy, but it was a good start to the summer season.